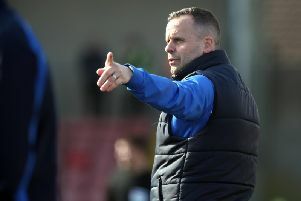 Coleraine may have won their last five games, but boss Oran Kearney is determined not to let his side rest on their laurels. Despite being down to the bare bones last week they picked up a hard-fought win at Ballinamallard to move up to fourth place in the table. Kearney is refusing to get carried away though and pointed out the importance of this Saturday’s game. “We have to go an do it again now against Ards,” he said. “It was great to get another win, but that’s history now we have to go again and do all we can to get another three points. “Everything we did at Ballinamallard last Saturday will have no impact on the Ards game. “We’ll have two or three guys back which will help boost us, but we know Ards will be fighting for their life and that is always a very difficult team to play against. “The league table is what it is, but we are just focusing on the next game. Meanwhile Ards boss Colin Nixon is hoping to bolster his squad before the window closes after watching his side lose their last three games. “I wasn’t planning on doing anything major in the transfer market, but after that, I’ll have to have a re-think,” said Nixon who has been linked with a move for Kevin Braniff. Nixon added Northern Ireland U21 midfielder Josh Doherty to his panel on Thursday. The 20-year-old joined the Premiership club after spells with Watford and Leyton Orient. He has won five caps with the Northern Ireland U21 side and also played for the U17 and U19 teams.